A Southern Barbecue, a wood engraving from a sketch by Horace Bradley, published in Harper’s Weekly, July 1887. If any gastronomical treat could give the proverbially American apple pie a run for its money, it might just be barbecue. The culinary tradition of cooking meat low and slow over indirect flame (the true definition of barbecue – imposters who grill, take note) has become so prevalent over the years that BBQ itself represents a sort of pop culture, spawning TV shows, historically-focused road trips, and even fusion dishes like BBQ tacos. Barbecue’s ability to reflect whatever might be hot at the time (from reality TV to the taco craze) isn’t new; in fact, barbecue has a long history of permeation, perhaps best experienced by the ongoing barbecue feud that plagues the South. From the Atlantic to the Gulf, bordered by the western outposts of Texas and Kansas City, the area of the United States known as the “barbecue belt” houses four distinct barbecue traditions – Carolina, Texas, Memphis and Kansas City. From where did these traditions come, and how, in a relatively small region of the country, have they evolved along such different paths? The history of American barbecue is as diverse as the variations themselves, charting the path of a Caribbean cooking style brought north by Spanish conquistadors, moved westward by settlers, and seasoned with the flavors of European cultures. The first indigenous tribes Christopher Columbus encountered on the island he named Hispaniola had developed a unique method for cooking meat over an indirect flame, created using green wood to keep the food (and wood) from burning. Reports indicate that the Spanish referred to this new style of cooking as barbacoa: the original barbecue. As the Spanish explorers who followed Columbus turned their expeditions north, they brought the cooking technique with them. In 1540, close to present-day Tupelo, Mississippi, the Chicksaw tribe, in the presence of explorer Hernando de Soto, cooked a feast of pork over the barbacoa. Eventually, the technique made its way to the colonies, traveling as far north as Virginia. Barbecue belt residents would argue that the beef-based BBQ of Texas, or the mutton-based BBQ found in Kentucky, doesn’t constitute authentic barbecue. To be real barbecue, purists like North Carolina native Jim Villas (author of an article, first published in Esquire, aptly titled “My Pig Beats Your Cow”) argue that the meat must be exclusively porcine, because the original BBQ-ers of the southern colonies depended on the cheap, low-maintenance nature of pig farming. Unlike cows, which required large amounts of feed and enclosed spaces, pigs could be set loose in forests to eat when food supplies were running low. The pigs, left to fend for themselves in the wild, were much leaner upon slaughter, leading Southerns to use the slow-and-low nature of barbecue to tenderize the meat. And use it they did. During the pre-Civil War years, Southerners ate an average of five pounds of pork for every one pound of cattle. Their dependence on this cheap food supply eventually became a point of patriotism, and Southerners took greater care raising their pigs, refusing to export their meat to the northern states. By this time, however, the relationship between the barbecue and pork had been deeply forged. But the story of the South’s penchant for pork does little to explain the variations between their barbecue styles. For this, one must look beyond the borders of America, to the influence that colonial immigrants had on the flavor and preparation of the meat. The original styles of barbecue are thought to be those that originated in the easternmost colonies, like the vinegar-based “whole hog” barbecue found in Virginia and North Carolina. 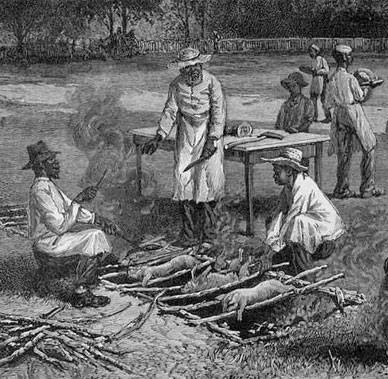 The technique of adding sauce to the meat as it cooks came from British colonists who incorporated the idea of basting to preserve the juices within the meat with the Caribbean barbecue technique. North Carolina’s vinegar-based sauces are also a remnant of these Briton’s penchant for the tart sauce. In South Carolina, which housed a large population of French and German immigrants, a mustard-based sauce was born, again, a reflection of the immigrant populations’ traditional preferences. Mustard has long been a fixture in both country’s cuisines: think of the famous Dijon in France (used in everything from tarte aux moutarde to the omnipresent bistro salad dressing) or the German’s penchant for including sweet and spicy mustard alongside their favorite wursts. From Carolina barbecue, the trend moved westward, eventually entering Texas. German immigrants in Texas had the land to cultivate cattle, and it wasn’t long before Texans were applying Carolina techniques to a different sort of animal entirely. In Memphis, the regionally unique sweet, tomato-based barbecue sauce was born from the city’s status as a popular port along the Mississippi River. Memphis residents could easily obtain a variety of goods, including molasses, which provided the region’s sweet barbecue taste. Out of Memphis’ barbecue genes, the last of America’s four main barbecue styles – Kansas City barbecue – was born. In the early 1900s, a Memphis-born man by the name of Henry Perry settled in Kansas City and opened a barbecue restaurant. In the restaurant, which Doug Worgul, in his book on the history of Kansas City barbecue, credits as the origin of the city’s particular barbecue style, Perry followed the style of his Memphis roots, using a sweet and spicy barbecue sauce. He did not, however, adhere to the stringent requirements that called for a pork-only barbecue style, and allowed beef and other meats to be sold as well. Expert Dotty Griffith refers to Kansas City barbecue as the ultimate amalgamation of East and West (Texas) barbecue. But history can only go so far to explain the pleasure that occurs when meat hits smoke (and sometimes sauce). Barbecue lovers looking to savor the distinct flavors of America’s four barbecue styles aren’t alone; in fact, the siren call of the barbecue belt has caused many to make a pilgrimage to the region. Travel routes have been suggested for aficionados looking to chow down on meat cooked low-and-slow, but for those really looking to expand their barbecue knowledge, check out the Daily Meal’s recently published 2013 guide to the “Ultimate BBQ Road Trip,” which spans over 5,120 miles and includes 60 of the country’s best examples of barbecue.